In this experiment you will use your first digital input: a switch. The SPDT (Single-Pole, Double-Throw) switch is a simple way to select between two options, especially when paired with an "if" state. You will use that switch to select which of the two LEDs will blink. The Single-Pole, Double-Throw (SPDT) switch has a common pin in the middle and then two other pins that, depending on the location of the switch, are either connected to the common (center) pin or not. Reading a switch is similar to a button. 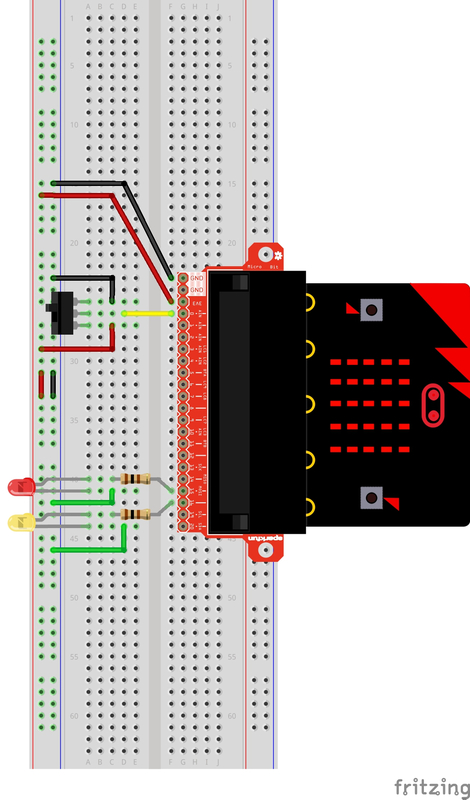 You need to connect the common pin to a digital General Purpose Input/Output (GPIO) pin on your micro:bit and the other pins to 3.3V and ground. It doesn’t matter which pin is which. 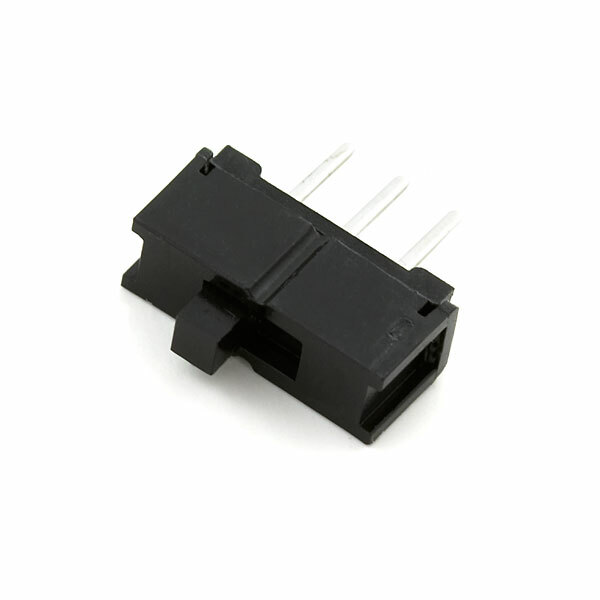 When you move the switch, the common pin will either be HIGH (connected to 3.3V) or LOW (connected to ground). Ready to start hooking everything up? Check out the wiring diagram and hookup table below to see how everything is connected. Note: The full-sized breadboard power rails have a break down the middle. If you end up using the lower half of the power rail you will need to jump between the upper end and lower end. Just as the write_digital() statement turns a pin on (1) or off (0), the read_digital() statement determines the state of a pin, which is either HIGH (1) or LOW (0). By building a circuit that connects 3.3V or ground to a pin, we can detect if a switch is thrown or a button is pressed. Depending on the state of the switch, a different LED will blink. If you move the switch to connect the signal pin to 3.3V (HIGH) then the LED connected to pin P15 will blink. If you flip the switch and ground the signal pin, then the LED on pin P16 will start blinking, and LED 1 will turn off. The wires for the switch are right next to each other. Make sure that signal is in the center with voltage and ground on the outside pins. If you connect ground and voltage, your board will short out and shut down. Make sure your power LED is on. If it is off, pull the signal wire and see if that changes anything. If you short circuit your micro:bit board, it will turn itself off to protect the circuitry. No worries; these circuits are all super stripped-down to make playing with the components easy, but once you throw them together, the sky is the limit.